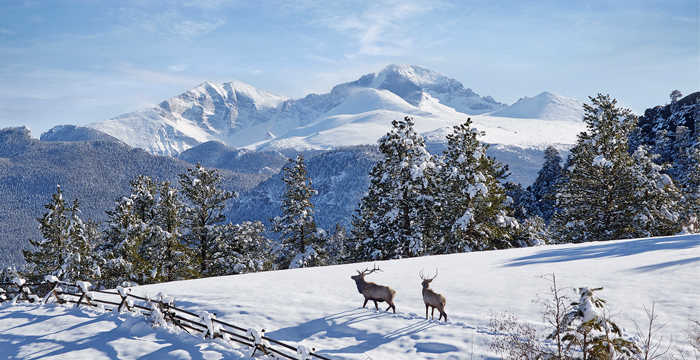 Estes Park represents the ideal Rocky Mountain winter wonderland. 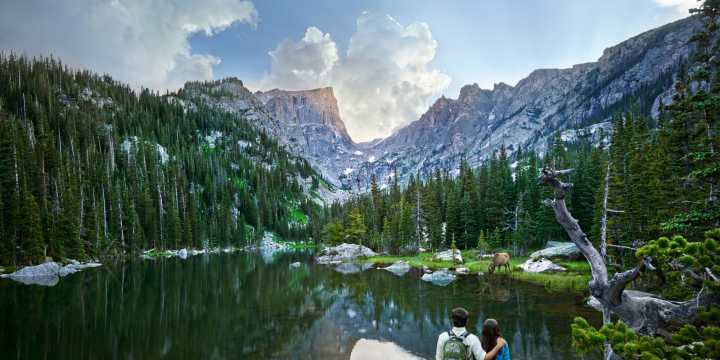 Many think of Estes Park as a summer hot spot, but the easy drive, low prices and abundance of winter recreation make it the perfect place to hide out for a long weekend and escape the daily grind. Read on to discover more about what makes Estes Park Colorado’s best kept winter secret. When you want to get away in the winter, the last thing you want to be doing is waiting in traffic, staring at an endless trail of taillights. With a quick drive up an easy, well-maintained highway, you’ll be sitting in the serenity of Estes Park in no time – taking in the views of tails – as in wildlife – rather than taillights. Ready to get beyond groomers and resort “backcountry” runs? Get a taste of the real thing just outside Estes in Rocky Mountain National Park. One of the more popular backcountry locations in Rocky is Hidden Valley, a former ski area with a variety of terrain levels. More experienced skiers and riders can venture deeper into the park, armed with knowledge, equipment and skill. Or consider going with a professional guide until you know the ropes. Here in Rocky, backcountry explorations go beyond just skiing, from snowshoeing to mountaineering, cross-country to ice climbing, you can find the winter adventure that best fits your desire and your skill level. 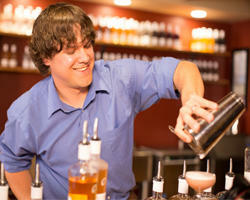 Local’s Tip: Celebrate your accomplishments with a craft beverage in town. With breweries and taprooms, a winery, a distillery tasting room and a new local distillery, there’s plenty of options around town! One of the more affordable mountain towns to visit during the winter, Estes Park will have you making more memories and worrying less about your wallet. 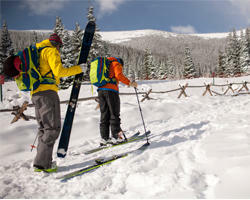 Unlike winter resort towns, lodging and equipment rentals are affordable in Estes this time of year. Area gear shops and outfitters have everything you need to go exploring, and the variety of lodging means there’s something for every style and budget. 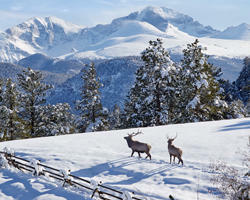 Estes Park is known for an abundance of wildlife, and most are far from hibernating! In fact, with a transformed winter landscape and fewer people around, animals can be easier to spot and the incredible scenery offers a unique wildlife experience. If you’re unsure where to go, local photographers and tour operators offer wildlife photo safari tours to ensure you get the perfect shot. 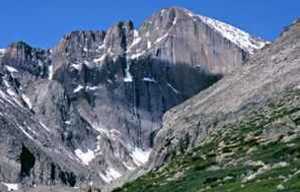 In a sense, Estes Park serves as Colorado’s proving ground. Offering adventures for every level of explorer, from beginner to expert. For all the newbies out there, the easier, more accessible terrain and the abundance of guides available mean that Estes Park is the perfect place to learn a new skill, take your knowledge to the next level, or simply have your first Colorado snowy escape! From ice skating to winter fly fishing, snowshoeing to horseback riding, you’re sure to find your perfect entry activity! You’ll feel transformed to a time of local boutiques and bookstores as you cruise Estes Park’s historic main street, Elkhorn Avenue. Unique, locally-owned shops line the street and the river walk – from home décor to modern attire, prized antiques to art galleries. Experience a mountain main street like no other in the Estes Park village. You know you’ve found a good spot when you’re surrounded by locals, and this time of year that will be in any of the cozy mountain restaurants, seated near a wood stove or crackling fireplace. 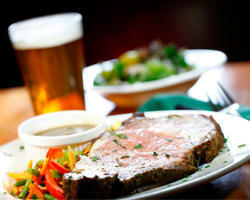 Perfectly-cooked steaks, authentic Nepalese cuisine, sumptuous seared scallops and buttery trout are all on the menu in Estes Park’s great variety of local dining. Local’s Tip: Grab a local pint or crafted cocktail while enjoying some live music. Many places around town have a regular schedule of performances, open mic nights and dinner tunes. The Rock Inn is known for their bluegrass – watch this video for a taste of the popular local band Chain Station! Eager to know more about winter adventures & sports? 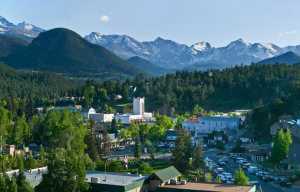 Estes Park is the perfect place to get your learning on! The Rocky Mountain Conservancy, the Colorado Mountain School and others offer a wide variety of winter outdoor classes to help you achieve your winter adventure goals! From avalanche courses and ice climbing to ski mountaineering and wildlife photography, they can show you the ropes in Estes Park. Any serious winter explorer knows that the best way to warm up is from the inside out. Estes Park has become Colorado’s whiskey capitol - the perfect spot for that après sipper. With Colorado’s largest selection of whiskey located at the Stanley Hotel, the Dancing Pines Distillery tasting room downtown, local distillery Elkins and savory events like the Whiskey Warm Up (March 11th), you‘ll easily find the best way to melt off that Rocky Mountain chill. Snow falling doesn’t mean that the adventures in Estes end, but rather that new ones are just getting started. The secret to avoiding big-ticket prices and long traffic lines this winter? A getaway to Estes Park for your next snow fun fix!